The other day I was pulling a load of clothes from the dryer and noticed that my laundry room is pretty drab. And by drab I mean, strictly utilitarian, not a single piece of art on the wall and not an ounce of color to be had. While I have no plans to whip out a can of paint right now (it’s the holidays, I work two jobs and I don’t like painting THAT much), it’s easy enough to add some character to a laundry room by some wall decor. 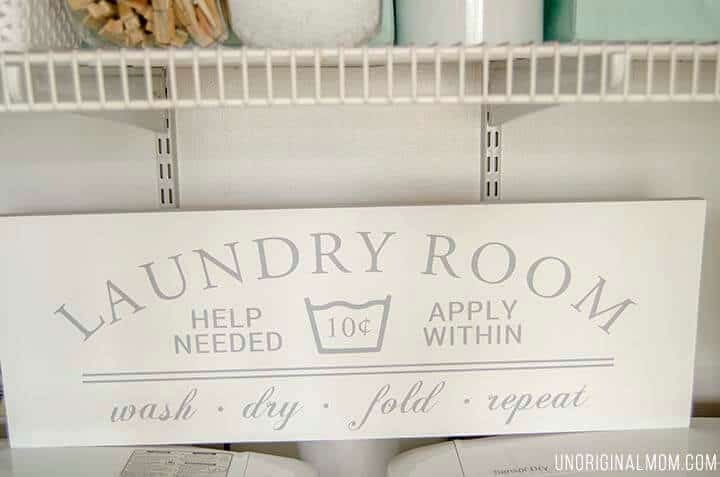 I’ve rounded up some adorable DIY signs that would be perfect for almost any laundry room that will take it from drab to fab in no time at all. Nothing says laundry like a says that say, well, “Laundry!” This sign says it all, and with simple style. Made from piece of scrap wood, several layers of paint and some skillful sanding is all it takes to get this new sign to look old and rustic. This is a great beginner sign because you don’t have to be perfect! The imperfections only make this signage more lovable. Check out how easy it can be to make this for your own laundry room at Ana-White.com. I know I’m in the minority when it comes to loving laundry, and if you find yourself dreading the routine folding and putting away then this sign’s for you. 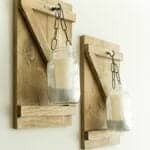 Made from a pallet and simple printable, this wall art is perfect for large and boring laundry room walls. Large bold font and soothing teal colors that are applied to look old and worn out, this simple phrase says it all. 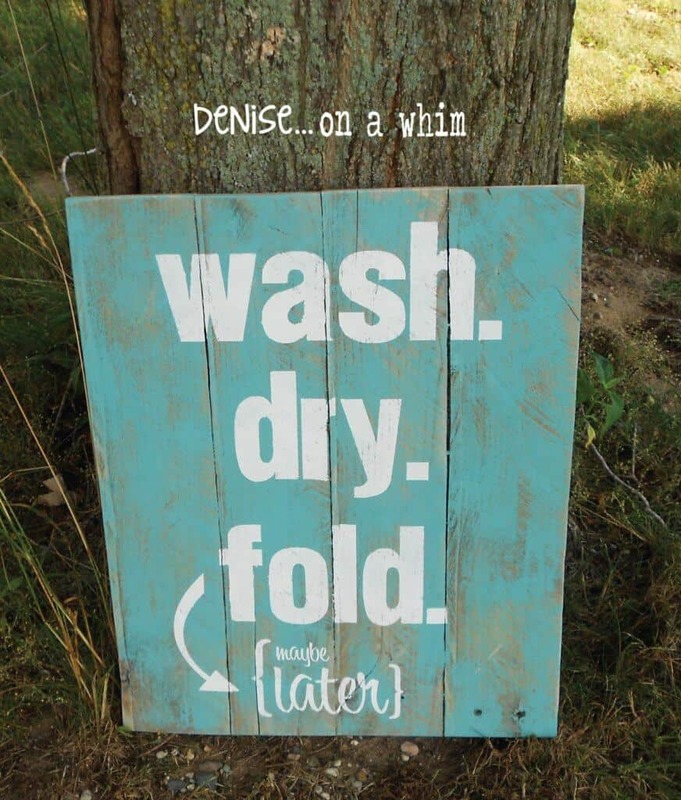 Grab this free printable so you can make your own, and check out other fun DIY projects at DeniseOnAWhim.blogspot.com. Oh if only it cost $.10 to hire help for laundry! 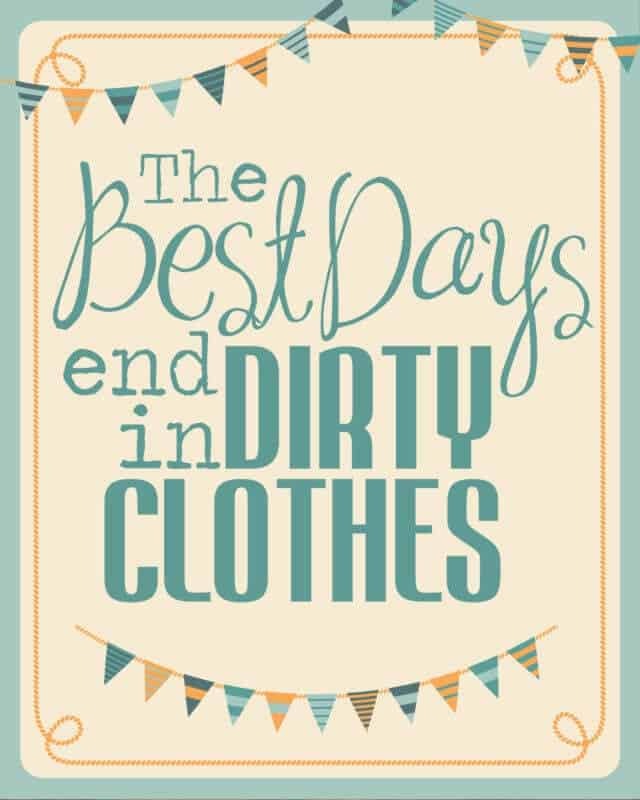 Yes, I love laundry, but there are some days where the load of clean clothes sits in the laundry basket waiting for someone to fold and put away and that usually means me- when I find the time. 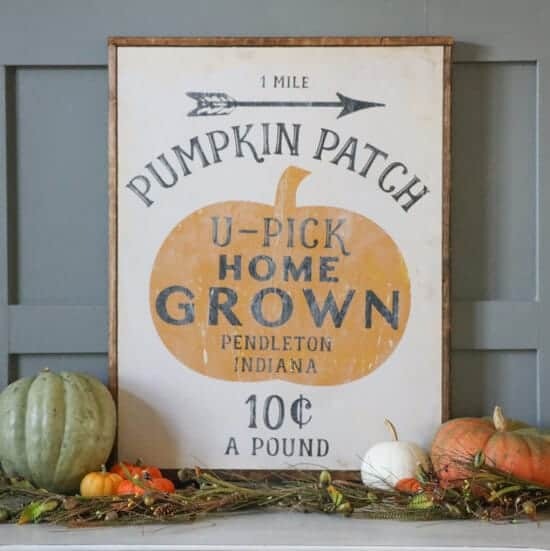 I love this sign because it’s “old school” looking, cute and completely homemade. 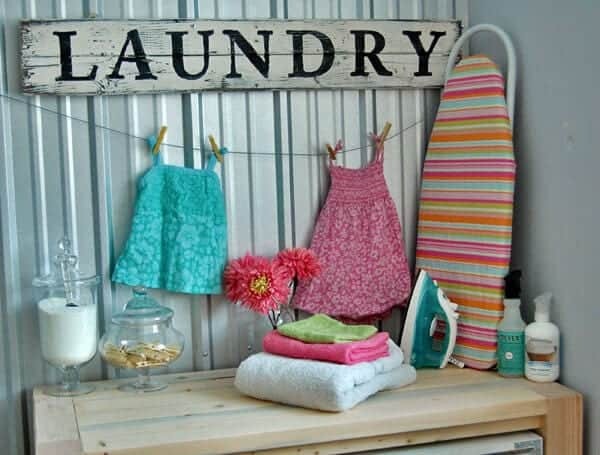 Using a simple wooden board, some cut out vinyl from a Silhouette, and some patient painting, it’s pretty darn easy to get this pizzazz for your laundry room. UnoriginalMom.com has all the steps from start to finish, so head over and get crafting! As moms, we find all sorts of “treasures” in the laundry. Rocks, crayons and of course money. 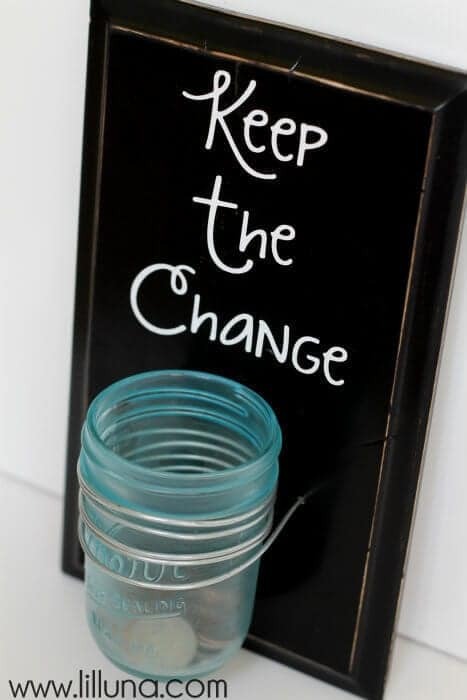 Start your kids college fund by corralling all that loose change into a fun sign like this “keep the change” one. 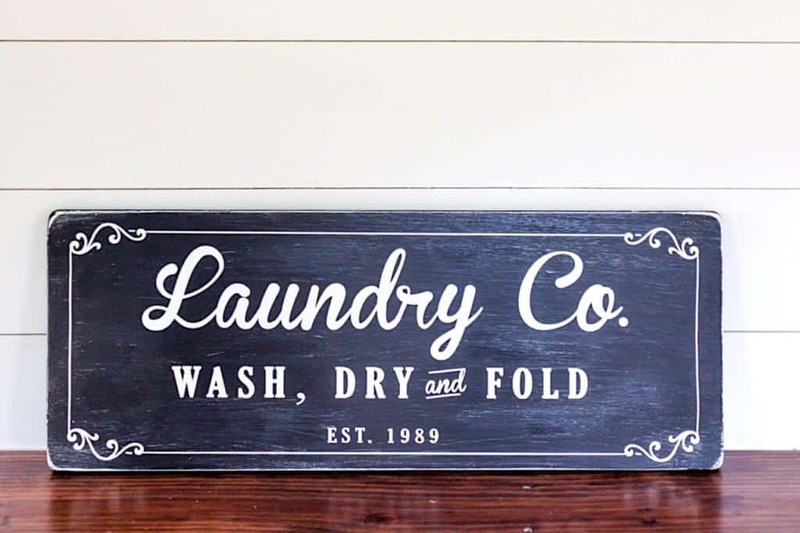 Made from an old drawer front (a small wooden board would just as easily do the trick), a painted mason jar, some wire and lettering, this signage makes all money fair game when it comes to laundry. 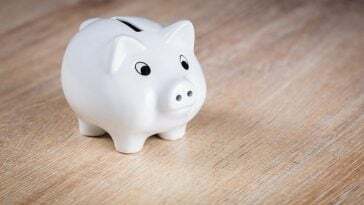 Consider it payment in full! Find more crafts, decor and recipes at LilLuna.com. Oh, the dreaded missing socks. I always know my husband sorted the laundry when I find 3 half pairs of socks coming out of the dryer (frown face). I never know where to put the lonely sock as I wait to do the next load of laundry, for fear it will disappear, but this super easy clothespin sign solves all my problems. A simple board is painted, affixed with clothespins and then basic lettering is added and voila! 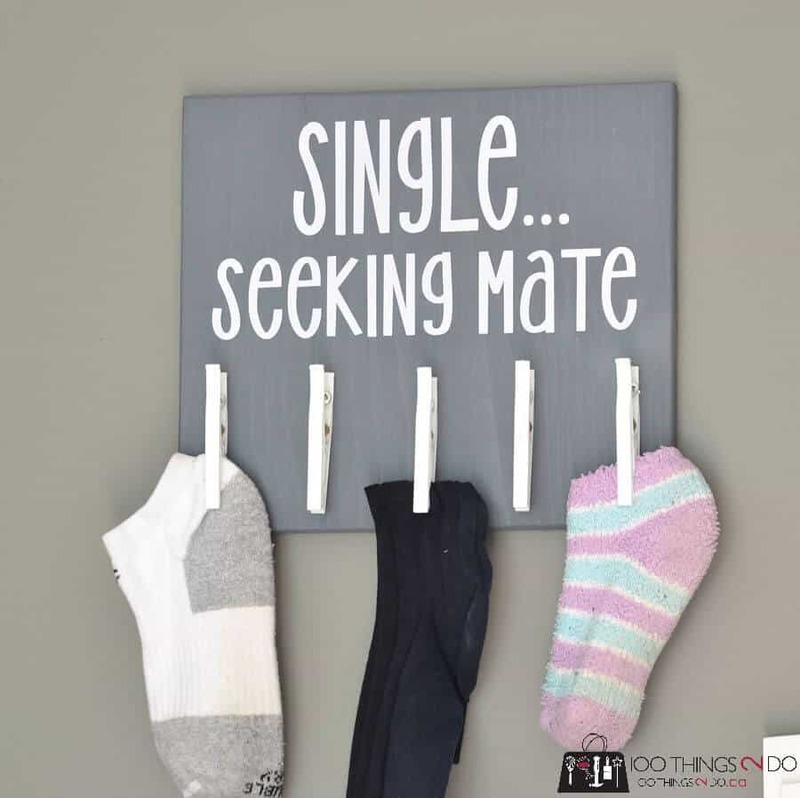 You’ve got a perfect place to keep those socks in plain sight, just waiting for their mate to appear. We found this cute sign at 100ThingsToDo.ca. It often feels like laundry is it’s own full-time business and that’s why we love this sign. Perfect for a modern farmhouse design, the bold fonts and dark colors make it easy to spruce up your boring laundry room. 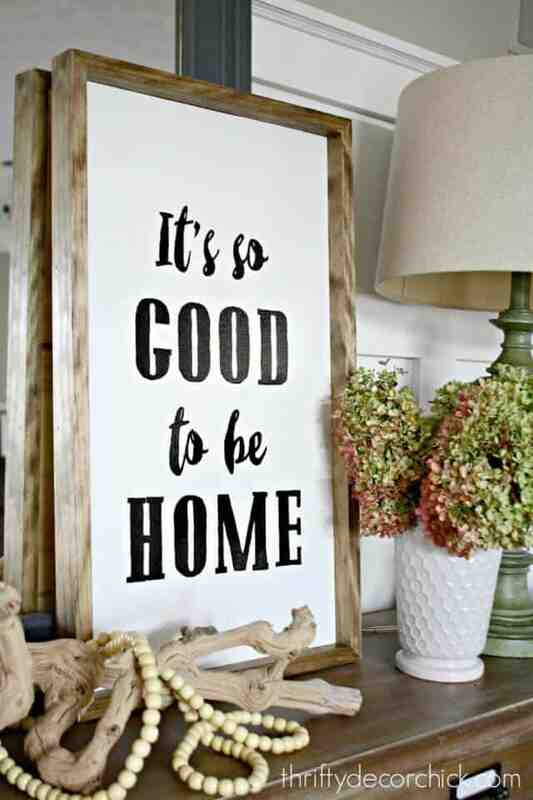 Made with a wooden board and cut vinyl lettering, you’ll need a craft machine like a Silhouette or Cricut to make this. It looks so good, people will be shocked your made it yourself! Get the full tutorial at GatherAndFlourish.com. As a mom, you no doubt love items that do double duty, and this sign is no exception. Not only does it look great hanging up, it’s got the hardware to turn it into a perfect place to hold delicates and non-dryable garments too. 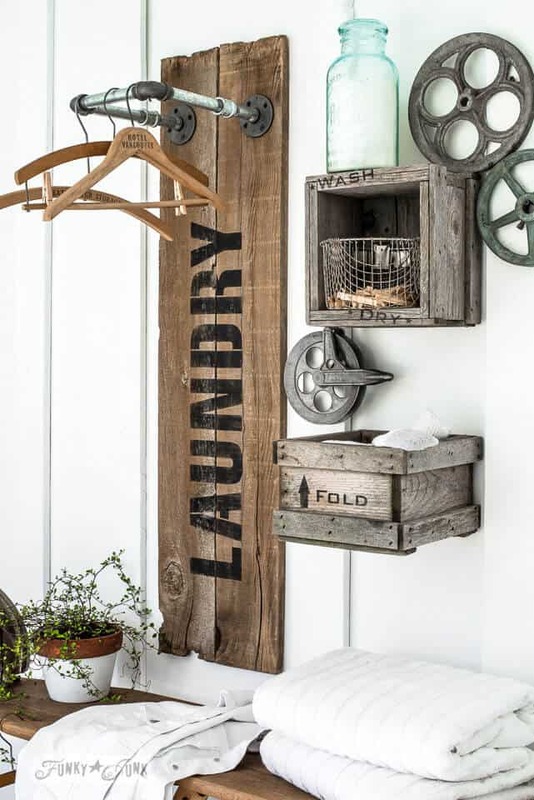 Reclaimed wood and pipe fittings form the basis for this industrial looking wall art that is perfect for large laundry rooms that need some style. Find more funky decor projects at FunkyJunkInteriors.net. As a Harry Potter lover, I couldn’t pass up this sign when it came to adding to this list. If you don’t follow HP, then you’ll need to know that S.P.E.W stands for the Society for the Promotion of Elvish Welfare, and it’s an organization that seeks to free elves from servitude. All you need to do is give an Elf a piece of clothing and they’re free! In the second Harry Potter book, a main elf was given a sock to free him, and that’s why this sign is just so stinkin’ adorable. 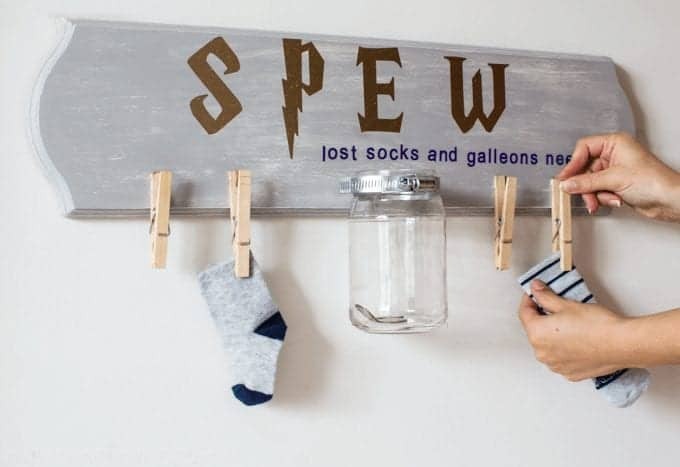 Hang your lost socks and change (galleons in HP speak) on this sign and get back to reading your beloved Harry Potter. Find this fun idea and the tutorial at SimplyMadeFun.com. 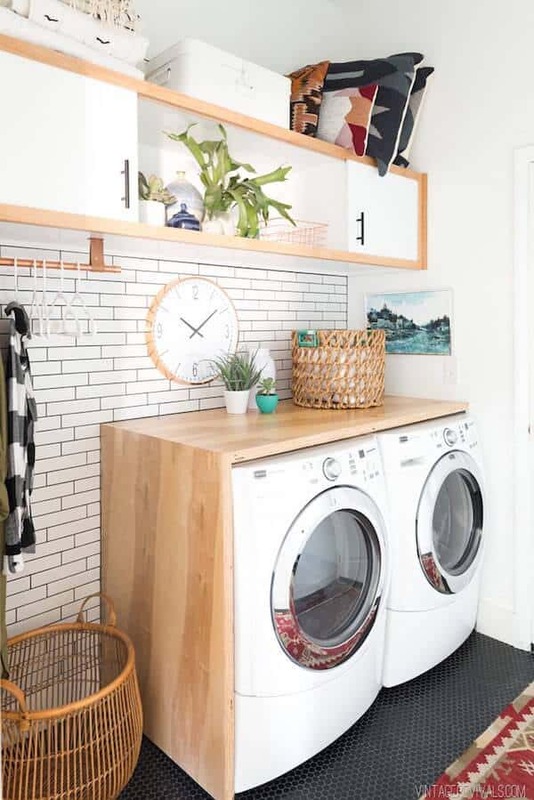 We’ve got more fun laundry room inspo!